We can extract the residue from pottery sherds. Pretreatment – Please contact us to discuss the nature of your research objective to ensure the most appropriate material selection and pretreatment of your pottery sherds. You are welcome to request that we contact you after the pretreatment to discuss options for AMS dating. The lab is more than happy to extract the residue then return the sherd to clients as requested. Please make sure to indicate on the data sheet if the sherd needs to be returned. Otherwise, it will be discarded upon completion of the analysis. More details can be found on the Sample Retention and Return of Excess Materials page. The lab prefers to date the burned food residue extracted from the interior surfaces of a sherd as this offers the best chance of a date that will be representative of the last time of usage. In general the burned food residue has to be a patina that can be removed in small bits or chunks rather than a sooty powder. When the residue is so thin that only a sooty powder can be removed, it is difficult (if not impossible) to perform an alkali treatment to remove humic acids that may have come in contact with the material from overlying sediments or surface or ground water interactions. For sherds that do not have any burned food residue extractable from the interior of the vessel, the next best thing is to date the “bulk sherd organics,” which are the total organic materials from the clay or tempering agents, anything the pot may have been used to hold during its usage, and any organic substances that have come into contact with the sherd since burial. Dating the “bulk sherd organics” will typically yield either an accurate date if the included organic materials are all essentially contemporaneous to the time of use or a “minimum age” result, meaning that the pot is at least as old as the radiocarbon age indicates. However, it may be actually somewhat older if recent organic materials have been incorporated into the pot due to mobilized humic acids. Dating organic tempering agents is possible when the organic material is either charred or the temperature of the firing process was not hot enough to burn it away. Shell temper will be unaffected for firing temperatures less than 600°C. If the temperature exceeds 600°C, the carbonate can dissociate, releasing its carbon as carbon dioxide (CO2). Upon cooling, any available CO2 will reform the carbonate. If this CO2 was the original CO2, then the shell carbon content is not affected. However, if CO2 is available from the clay, the reformed carbonate will reflect the age of the clay. If the clay is older than the time of firing, the carbonate age will also be older than the time of firing. If the CO2 is available from the firing fuel, the age of the shell will reflect the age of the fuel. Also, one must consider the homogeneity of the reformed carbonate in that case. Different fragments could be reformed from multiple sources of CO2. With radiocarbon dating, the greatest bias is always in the more recent direction as modern carbon adds both carbon by weight and radioactive 14C by content whereas older contamination (or very old clay) has less of an impact unless there has not been any secondary contamination by younger carbon. It takes a lot of very old carbon to make a significant difference in contamination. 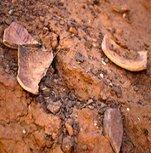 Pottery sherds that have sufficiently thick charred residue or soot on the surface can be dated if the soot can be scraped off without incorporation of the clay matrix underlying it. Depending on the consistency of the soot, the pretreatments may be varied allowing for either acid or acid and alkali. Accuracy relative to the time of use of the fires will depend upon the source of the soot. If it is from marine food residues, it will have “reservoir effect” associated with it which must be corrected for. If the soot is from old trees (tree trunks) the date could be too old. A radiocarbon date represents the last time the analyzed material was exchanging CO2 with the air. In trees, this is only the outer rings, roots, twigs, small branches, bark, nuts, etc. These are the present growth medium, whereas the center ring of the tree is when the tree started to grow. As you go back towards the center of the tree from the bark, every ring is one year older. If you have a 200 year-old tree that is living today, a date on the bark represents today and a date on the centermost ring represents 200 years ago even though the tree is still alive. Therefore, the accuracy of the radiocarbon date depends upon where the wood came from within the tree. It also depends upon the absence of man-made contaminants.